Description: This striking deciduous shrub, introduced to horticulture by David Douglas in 1826, has been a garden favorite ever since. 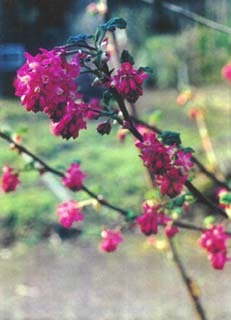 It can reach 8 to 10 feet, with pendant flower clusters of beautiful red to pink flowers, blooming March-June. Fruits are black, not remarkable as a food source for humans, but enjoyed by robins, towhees, thrushes, waxwings, sparrows, jays, and woodpeckers. A nectar source for hummingbirds and butterflies. It is commonly found in westside forests and open woodlands, and will tolerate sun or shade and moderate water.